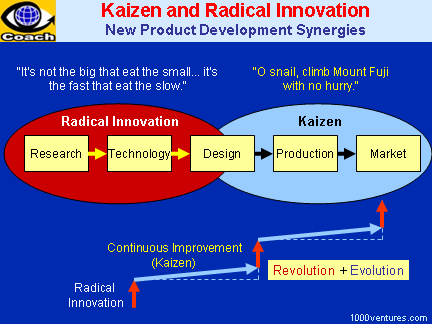 Kaizen is evolutionary, focused on incremental improvements. U.S. and Japanese companies use quite different manufacturing and market leadership strategies. Kaizen means "improvement". Kaizen strategy calls for never-ending efforts for improvement involving everyone in the organization – managers and workers alike. One of the most difficult aspects of introducing and implementing Kaizen strategy is assuring its continuity. When a company introduces something new, such as quality circles, or total quality management (TQM), it experiences some initial success, but soon such success disappear like fireworks on summer night and after a while nothing is left, and management keeps looking for a new flavor of the month. Kaikaku is breakthrough rapid improvement, radical improvement of any activity, in particular to remove waste (or 'muda'). Kaikaku is also known as Breakthrough Kaizen, Kaizen Blitz, Flow Kaizen and System Kaizen. Kaikaku is about large rapid improvement, similar to radical innovation, though innovation is not necessary for Kaikaku. Kaikaku is sought in addition to Kaizen, not in place of Kaizen. 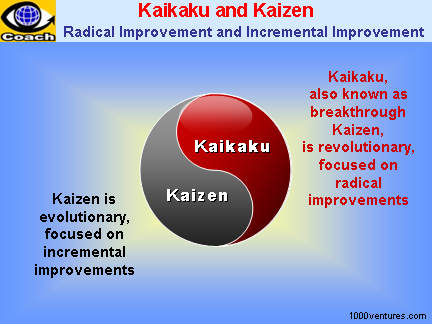 Kaikaku is a rapid change event as opposed to Kaizen which is smaller incremental improvements. Kaikaku is revolutionary while Kaizen is evolutionary. When approaching a problem situation, it might require radical improvement to start with (Kaikaku), then be continuously improved (Kaizen). The Japanese success in world markets was focused less on products innovation than on innovative productivity and marketing. Creative thinking led to small, but highly powerful, improvements. Canon employees are offering around 50 improvement ideas per year per employee. In some Canon plants, the foremen are told to set aside the half-hour as Kaizen time – time to do nothing but thinking improvement in the workshop. The foremen use this period to identify problems and work on Kaizen programs.